This diabetes cookbook is designed for diabetics who enjoy Asian food. With healthy recipes contributed by staff from Newham University Hospital NHS Trust. Asian patients with diabetes provided the inspiration for this diabetes cookbook. Through education which took place in the form of story telling sessions at Newham University Hospital, the patients applied their newly learned principles of healthy eating to modify their favourite dishes. In time, individuals realise that living with diabetes can be combined with continuing to have a good quality of life - providing some appropriate adjustments are made - these usually include adapting one's eating habits and exercise routine. This book uses recipes contributed by men and woman with diabetes. This is a helpful and interesting book because it has a good selection of easy-to-follow, everyday recipes for a range of Asian dishes. 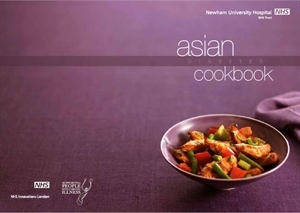 Single copies of the Asian Cookbook can be ordered through this site; for multiple copies, please contact Medipex at ennovations@medipex.co.uk.